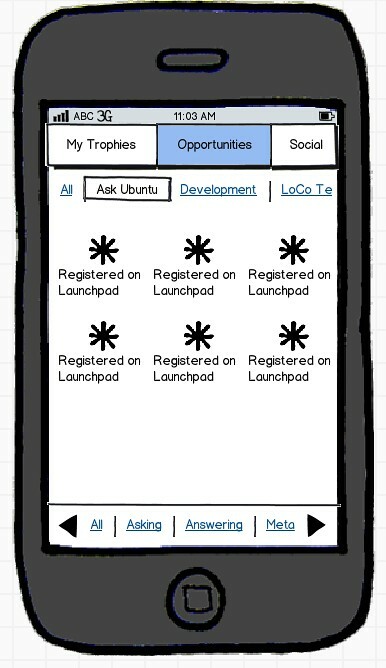 This document outlines a core spec for how a cross-platform Mobile app can work for Ubuntu Accomplishments. Swipe Left/Right - switch categories in the My Trophies / Opportunities views. If viewing Opportunity Information, a swipe left/right will show information for the previous or next opportunity. Scroll Up/Down - scroll the list of Trophies in My Trophies or scroll the list of opportunities in the current category/sub-category in the Opportunities view. Menu - the Menu (either menu button in Android or Menu center option on iPhone) is pressed there are different options. See below. Here you can see all of the trophies at first, and then as you swipe left/right, it flicks between the different categories (note, there are no sub-category filters in this view). 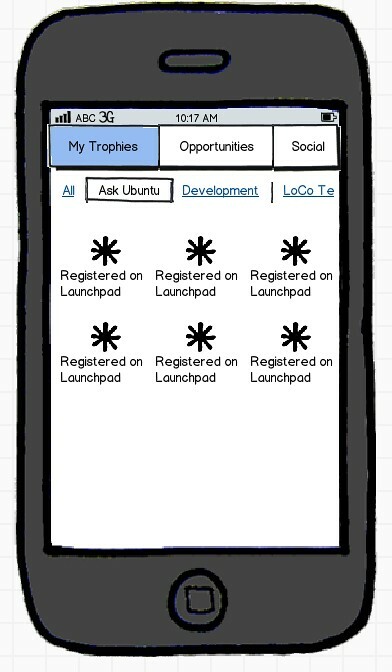 Tapping a trophy shows the accomplishment details (same as in the Web UI/Desktop, just re-formatted for mobile). Each time the category is changed after a swipe, the upper category is selected. 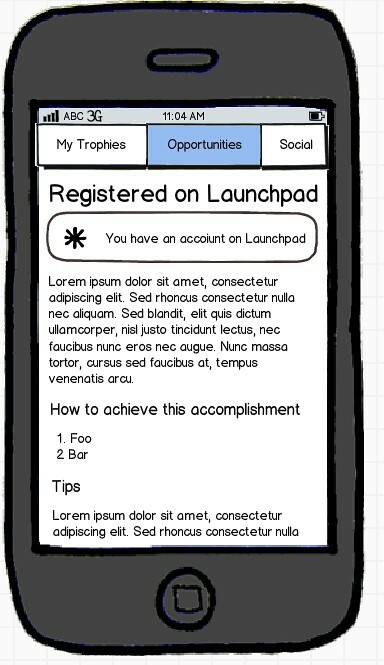 Swiping left/right also scrolls the category line to show the user that other categories can be swiped to. In terms of swiping it works the same way as My Trophies, but at the bottom there is a sub-categories filter for the current category; this works in the same way as the desktop app (it is only shown if there are opportunities with sub-categories, and the arrows can move between sub-cats...tapping a sub-cat will select it). The user can get back to the big list of opportunities by tapping the top Opportunities button. This means that some of the image assets can look more native to the device being used. The mobile app would just need to include a webkit widget (or other web widget) that shows the site, and then map input events to URLs. It would be helpful if the Web Gallery performed the smooth transitions. I would recommend that on Android, when someone hits the menu button, it displays native buttons for the different options (e.g. Profile, Settings), but each option links to the different settings panels on the site. There may be an easier way of doing this.